This past Saturday was my 31st birthday…I don’t really feel older, I just hear my biological clock ticking MUCH louder! I opted for a low key night out to dinner with three of my favorite people, Brian, Jamie & Brittani. It was a great way to spend my 31st and was full of food, drinks and laughs. For my birthday, Brian, my brother and my parental units chipped in to purchase me the 60mm f/2.8 Macro lens that I have been lusting after for over a year. Needless to say, I was pretty pumped with my new piece of camera gear and have really enjoyed experimenting with this lens. I will be sure to post some macro shots in the very near future. I also received the Perfect Brownie Pan from my fab friend, Jo. Yup, it’s the pan from the infomerical and I was stoked to put it to use. Although I am pretty leery of infomercial gadgets and the uber cheesy personalities (Slap Chop Guy) that try to push them down my throat at 3 am, this product is actually quite rad! It worked like a charm and is pretty darn easy to use. It makes slicing and serving the brownies a breeze and I am excited to add this to my ever-growing collection of pans! Thanks, Jo! 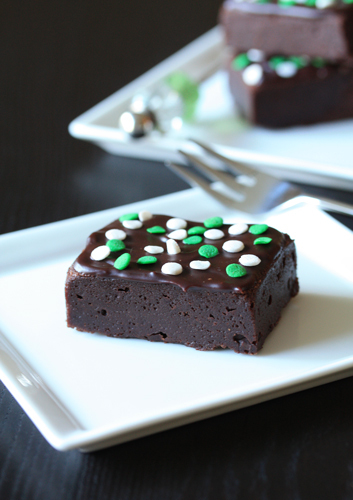 Since I had a new pan, I had to put it to good use and make some brownies for St. Patrick’s Day. This recipe was recommended to me through a tweet from Carrie of the blog Kitchen Vixen. They turned out fabulous…rich, chocolatey and fudgy…just how we like our brownies. I topped them with ganache and some white and green sprinkles to dress them up for St. Patrick’s Day and I think they turned out pretty cute! If you have a free sec, be sure to head over to my Facebook Fan Page and become a fan…then check back tomorrow for a sweet giveaway! Thanks for stopping by, have a fabulous St. Patrick’s Day! If you’re going out, remember to drink responsibly and drive safely! 4 squares of baking chocolate. 2. Melt butter and chocolate together over a double boiler. As mixture is melting, dissolve coffee into hot water and add to mixture, along with chocolate liqueur. Once mixture is melted, stir in brown sugar, and let sit. 3. In a large bowl, sift together cocoa and flour. 4. Once chocolate mixture is lukewarm, add in eggs, one at a time, stirring until mixture is glossy. 5. Pour mixture into flour and cocoa. Stir until well combined. These look great! So festive and delicious! Happy Birthday, and congrats on your new lens. Happy belated birthday! Those look like some of the fudgiest, moist brownies I have ever seen! Happy Belated birthday to you! Congrats on your new lens. I’m pretty sure we’ll be seeing some pretty macros shots from you soon! Btw, thanks for the lovely fudgy brownie recipe. Have been on the lookout for one for the longest time, been only getting cakey ones so far. Brownies look good and that pan is awesome! I want it! Happy Birthday! Thanks for sharing a great brownie recipe, they look delicious! and happy birthday! even if it’s late, I’m glad you had a great time! HAPPY BIRTHDAY!!! Those brownies look awesome!! So rich and decadent! HAPPY BIRTHDAY!!! 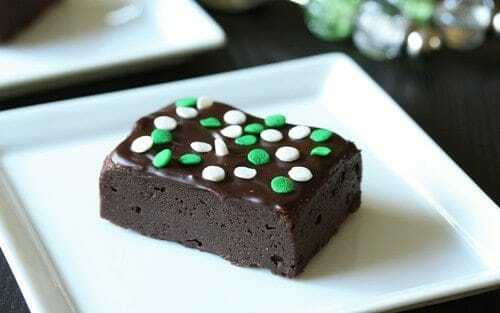 Great looking brownies. Maybe I’ll buy that pan, too. Oh wow those look so rich! Of course who doesn’t like rich brownies. No theme bake for me today. I’m thinking more towards something special for easter. BTW. Happy Birthday and many sweet treats to come! mmm those look so fudgey and yum. now, im really thinking about purchasing that perfect brownie pan. I just happened to see these on foodgawker and I HAD to click on the link. looks amazing. WOW that is a cool pan – does it really work great? Now I want 1 too! I just printed out your recipe. I do not have chocolate liquer – might have to just use vanilla instead. btw, if you don’t mind, I want to know how much gram of flour that you put on a cup? Goodness! I want one or three hundred of those brownies. I must make this one day. The brownies look so great and happy birthday! Ooooooh, these look deadly delicious! I’m going to have to make these for sure! Thanks for this recipe! 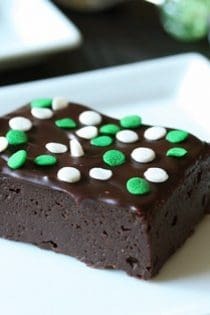 I have been looking for a really fudgy brownie recipe, and this is so cute and definitely looks heavenly. I made these and they are glorious! Since they are quite rich and decadent, I took them in to work the next day, so the hubby and I didn’t inhale them, and they were gone in minutes!! Add a glass of ice cold milk and this has ‘perfect way to end a bad day’ written all over it!! Is “Baking Chocolate” Unsweetened Chocolate? Judith, a square of baking chocolate is 1 ounce. You can see the pan here. These brownies look fantastic, and I’m going to make them tonight. I just want to know, in weight is it 4 ounces of chocolate for the squares, or 2 ounces? Hi, Andrea! Each square is 1 ounce, so you should use 4 squares of baking chocolate. I hope you enjoyed them!